​Proper digestion allows nutrients to get where they are needed in the quantities that they’re needed. If you suffer from a compromised digestive system, you can eat all the fresh fruit and produce you want and still suffer from malnourishment. This is where plant-based enzymes come in. The best enzymes fill the void left by a compromised digestive system and enable badly needed nutrients to enter your system and restore order and proper function. When this happens, people usually experience a reduction in gas, heartburn, bloating and reflux while also feeling more alert and energetic. ​Why Should Vegans Take Digestive Enzymes? ​Vegan digestive enzymes can help restore order to your GI system and enable a higher level of nutrient absorption and overall health. Below are the best vegan digestive enzymes available on the market today. ​Rainbow Light uses only plant-based digestive enzymes. The kind that are often removed from the foods we eat during cooking or other types of processing. By restoring these essential digestive enzymes, they boost nutrient absorption and make digestion the smooth, effective process it should be. Few realize that raw foods contain virtually all the best enzymes needed to digest them and that those enzymes are removed by processing. Rainbow Light returns those enzymes to your gut where they belong. ​This advanced enzyme system is 100% vegan as well as being gluten, dairy, soy, wheat, and shellfish-free. You can get relief from bloating, gas, diarrhea, constipation and more by adding Rainbow Light digestive enzymes to your diet. ​Sourced from unprocessed whole foods. ​Vegan-friendly with no genetically modified organisms. ​No artificial additives or flavors. ​Gluten, dairy, sugar, wheat, and shellfish-free. ​Zenwise Digestive Enzymes utilize pre and probiotics to enhance intestinal health and ensure proper digestion of nutrients. Zenwise makes sure all the best enzymes are on the menu including lactase, protease, amylase, and papain. If you currently suffer from bloating, gas and general discomfort after eating or have been plagued by acid reflux or diarrhea, this potent combination of vegan digestive enzymes and 1 billion CFU of essential probiotics will help restore order and bring consistent relief. You'll feel more alert, have more energy and spend less time shopping for antacids. They're 100% vegetarian-safe and free of gluten, soy, and dairy. Zenwise allows you to put the power of vegan digestive enzymes behind you while boosting their effectiveness with generous amounts of both prebiotics and probiotics. ​Contain 1 billion probiotic CFU (colony forming units). ​Get fast relief from nagging digestive issues. ​There are a number of reasons why someone may experience reduced digestive efficiency, but in the end, it mostly comes down to the fact that, for whatever reason, they're simply not ingesting enough amylase, lipase, protease or other digestive enzymes with the food they eat. That food then sits undigested in the stomach which creates a cascade of health problems. Enter Enzymedica Digest Gold. It harvests plant-based enzymes from a range of vegan-friendly whole foods and provides them for you in a convenient once a day capsule. By taking this important supplement on a regular basis, you'll restore the proper balance in your gut and enable your body to make the most of the food you're eating. You’ll be able to say goodbye to diarrhea, reflux, upset stomach or bloating when you take Enzymedica Digest Gold whole food, vegan-safe, plant-based enzymes. ​A specific blend of the best enzymes formulated to restore harmony to your gut. ​Breaks down fiber, fat and other hard-to-digest foods. ​Vegan-friendly and sourced only from whole foods. ​Taking too many may cause bloating. ​Digestive inefficiency can stem from many causes including not chewing food properly, eating junk food, drinking too much alcohol or simply aging. If a lack of digestive enzymes is not addressed, it can lead to a range of health problems including acid reflux, lethargy, and even malnutrition. Source Naturals Essential Enzymes restore the proper level of flora in your gut which allows you to more effectively process the food you eat. Source Naturals digestive enzyme capsules are vegan-friendly and sourced from raw foods. This ensures purity and effectiveness and enables them to break down the fats, fiber, and carbs that have been mucking things up in your gut. ​Will help relieve nagging issues like reflux, chronic indigestion and more. ​Ideal if you eat on the run or have recently changed diets. ​A bit more expensive than others. ​If you are feeling lethargic lately or have developed chronic bloating, acid reflux or other GI problems that seemed to come out of nowhere, it may be you are missing some the best enzymes for digestion. Global Healing Center VeganZyme can restore them. VeganZyme leverages plant-based digestive enzymes to help re-establish the proper floral balance in your gut and get you back on the road to good health. Saturated fats, sugar, fiber, and even fruit can sometimes be difficult for the body to properly digest. VeganZyme breaks down problematic foodstuffs which allows you to metabolize food more effectively while also alleviating nagging GI problems. ​Fills the gap in the digestive enzyme chain. ​Sourced from 100% raw plant foods. ​Provides a full range of vegan digestive enzymes. ​Has the potential to cause minor side effects like diarrhea if overused. The job of these enzymes is to sift through food and harvest the nutrients while passing unused matter on to the intestines for elimination. Without the proper amount of the best enzymes, our gut becomes overwhelmed. It is simply unable to handle all the food presented to it, and the result can be anything from acid reflux to bloating, to mental and physical lethargy, and more. If you have recently begun experiencing gastric distress of some form it could be because a dietary change has left your system short of necessary digestive enzymes. In which case, any of the best digestive supplements above will likely help. Watch this video to learn more about it. ​Not all of them. Since digestive enzymes are a type of protein, they may be derived from either plant, fruit or animal sources. Fruit sourced - Digestive enzyme supplements are sometimes sourced from pineapple or other fruits that are heavy in them. However, they are not as potent as plant-sourced digestive enzymes and may not do as good a job re-establishing order in a compromised stomach. Animal sourced - Animal sourced enzymes are often harvested from the pancreas of pigs. There is nothing even remotely vegan-friendly about animal-based digestive enzymes. Because of that, it's really important for vegans to read the label on any digestive enzyme supplement carefully to make sure it's one derived from non-animal sources. In many cases, the problem will be a lack of digestive enzymes. Here are three potential benefits you may enjoy by taking this type of supplement. ​More effective digestion - When we experience bloating or reflux it’s at least in part because food is not being digested properly. The enzyme amylase helps the stomach break down whole grains, fiber, sugar and other tough-to-handle foods easily and thoroughly, thereby alleviating bloating and other symptoms of poor digestion. More effective workouts - People who aren’t seeing the kind of results they expect in the gym are often victims of not having enough of the best enzymes in their stomach. If proteins cannot be metabolized properly, muscle growth will stall. The digestive enzyme protease can help reignite your workouts by making more protein available for muscle repair and rebuilding. Greater control over your weight - When the stomach is short on digestive enzymes it will have a hard time gleaning nutrients from fats. When this happens, acid reflux is a common result as is weight gain from excessive fat stores. Lipase, an important component of digestive enzyme supplements, will help you process fat more efficiently and minimize weight gain. When taken as directed, the best enzymes are considered safe. Problems may arise when someone is so happy with the results they're getting that they feel "more must be better." Not so. Read all labels carefully and don't stray from recommended dosages. In addition, it’s wise to consult your doctor before making any dietary changes or taking any type of supplement that may change the way your body processes food. If you feel digestive enzyme supplements are somehow aggravating your situation, discontinue their use and talk to your doctor. ​Vegan digestive enzymes do the hard work of turning food into nutrients our bodies can use. If you suffer from chronic digestive issues, you likely will benefit from one of the best digestive supplements profiled above. 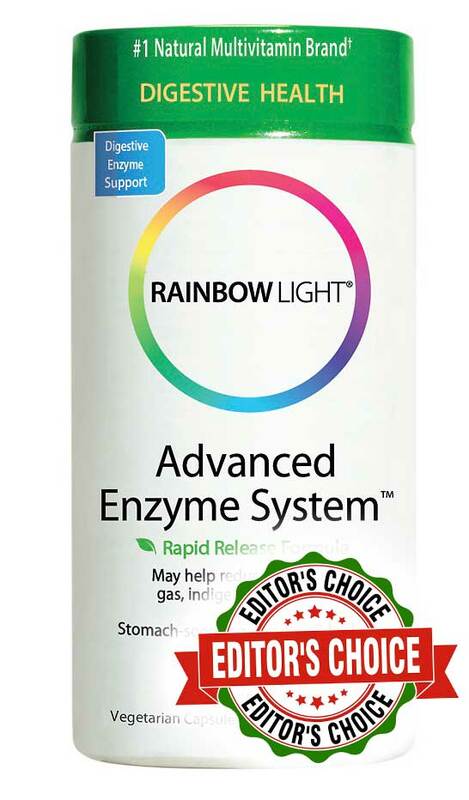 In our estimation, the best of the best vegan digestive enzymes are Rainbow Light Digestive Enzymes. They boast a full range of vegan digestive enzymes that will effectively break down the food that cause your bloating, gas, reflux and other problems, and they do so without generating side-effects or loading you up with things you don't want or need. If you are a vegan intent on restoring digestive harmony, you should try the Rainbow Light Enzyme System. You'll be glad you did.